Sri Chinmoy is a spiritual teacher who established meditation centres around the world; he was also a prolific poet, musician, artist and weightlifter. 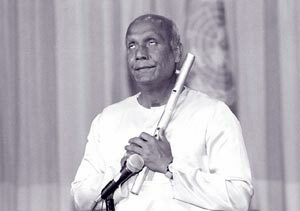 From 1970, at the behest of the then UN secretary-general U Thant, Sri Chinmoy took part in twice weekly meditations at the United Nations. Sri Chinmoy initiated many other projects, which aimed to promote the goal of inner and outer peace; this includes the Sri Chinmoy Oneness-Home Peace Run a global torch relay for peace. 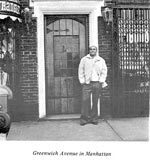 Sri Chinmoy was born in India and moved to New York, US in 1964, where he remained until his mahasamadhi in 2007. Sri Chinmoy (Chinmoy Kumar Ghose) was born on 27th August 1931. He was the youngest child of Shashi Kumar Ghose (his father) and Yogamaya Biswas (his mother). According to his horoscope the young Chinmoy was given the name of Ganapati. 1 Ganapati is the name of the elephant god, the Hindu deity who removes obstacles from the path of a seeker. However, as young child, Chinmoy was known by the nickname of “Madal”; Madal, meaning “Kettledrum”, proved to be an appropriate name. His family recalls how as a child Madal, was very energetic, inquisitive and at times mischievous. 2 Sri Chinmoy has recounted many stories from his childhood in which he relates his childhood experiences in the small Indian village of Shakpura. In one story he mention that, as a young boy, his greatest desire was to become a ticket collector on a train. 3 By contrast to Madal, his six elder brothers and sisters were quiet and reflective. 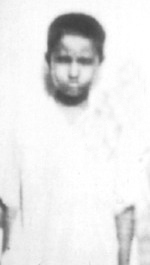 When Madal was still an infant, his eldest brother, Hriday entered the Sri Aurobindo Ashram in the south of India. Sri Chinmoy recalls with great affection the love and concern his family members offered him as a young child. In particular, he expressed gratitude to his parents for wishing their children to lead a spiritual life. The meaning of Chinmoy in Sanskrit is “full of divine consciousness”. Literally ‘Chin’ means “consciousness. ‘Moy’ literally means “full of”. On joining the Ashram, Chinmoy became consciously awakened to the spiritual life and felt an intense inner urge to realise God. During the years that followed, the young Chinmoy would meditate for several hours a day. He would wake up at 2.07am and meditate on his bed for several hours before his brother awoke. By the age of 13, he attained a state of self-realisation and would spend many hours in Samadhi or trance. Sri Chinmoy recalls one occasion, when after coming down from Samadhi, he forgot his own name; this was because he had become so immersed in the Transcendental Consciousness that he no longer identified with his body. Sri Chinmoy also describes another significant experience of meditation that took place when he was 14; this was an indication of his future spiritual mission in the West. Beyond my reach I know. His third poem in English was “The Absolute”; a poetic description of his highest meditation. Like many spiritual poets, Sri Chinmoy’s poetry has been described as having mantric quality. From an early age Sri Chinmoy was deeply inspired to write books. His first book was “Flame-Waves”, which was published in 1955. His second book was “The Infinite: Sri Aurobindo.” The third was ‘The Mother of the Golden All’. Since coming to the West he wrote over 1,600 books. Mostly they have been published by Aum publications, the in-house publishing branch of the Sri Chinmoy Centre, but several have been published by other publishers such as Simon & Schuster. Sri Chinmoy would have been content to remain in the Ashram furthering his meditation and taking part in the daily activities; but, an inner Command urged him to travel to the West to share the spiritual knowledge of the East with aspiring seekers in the West. On arriving in the West, Sri Chinmoy soon began giving talks and lectures on the subjects of Hinduism and Eastern spirituality. His first lecture was entitled “Hinduism: The Journey of India’s Soul” 12 Over the course of time, seekers became eager to study in depth the teachings and spiritual philosophy of Sri Chinmoy. The first Sri Chinmoy Centre (at the time called the AUM Centre) was established in San Juan Puerto Rico in 1966; the second centre was formed in New York. The 1960’s witnessed significant social upheavals in America and the Western world. With a backdrop of the Vietnam war, new social movements became disenchanted with the prevailing societal norms and young people, in particular, began to look for different approaches to religion and life in general. Yoga and meditation began to permeate the public consciousness and became popular through high profile figures, such as the Beatles, practising meditation. 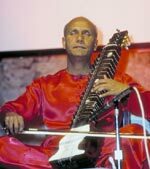 In the late 1960’s and early 1970’s, Sri Chinmoy travelled extensively around America and also to Europe and Asia. He offered lectures and public meditations at many universities and colleges, including prestigious universities such as Harvard, Oxford and Cambridge. His lectures were on different themes related to spirituality and meditation. During these lecture tours, he also established the first Sri Chinmoy Meditation Centres in Europe and the Far East. Sri Chinmoy’s yoga is firmly rooted in the spiritual traditions of the Vedas and Upanishads; at the same time, it offers a unique exposition of these ancient ideals. Sri Chinmoy’s path encompasses the path of devotion (bhakti yoga), selfless service (Karma Yoga), meditation (dhyani yoga) and the yoga of wisdom (jnani yoga). The heart is one of the main themes of Sri Chinmoy’s writings; he frequently encourages seekers to use the intuitive power of the heart, and not to rely only on the mind. He suggests that when we use the mind we are limited by our critical and negative thoughts; however, if we exercise the capacity of the heart we can have a feeling of oneness and experience the expansion of our consciousness. Although a spiritual Teacher (Guru) to many, Sri Chinmoy teaches that the only real Guru is the Supreme himself. He considers himself to be an instrument of God, like an elder brother in the family guiding his other family members. Another important aspect of Sri Chinmoy’s yoga is affirmation of the underlying unity of world religions. Frequently he has stated how all religions ultimately lead to the same goal, even if their outer expressions are different. Sri Chinmoy has written extensively on the United Nations expressing a belief that the United Nations expresses a most significant aspiration for world harmony and that it can be an important instrument for bringing people together to avoid conflict. Throughout his life, Sri Chinmoy participated in sports.He has sought to show how sports can be harmonised with the spiritual life. 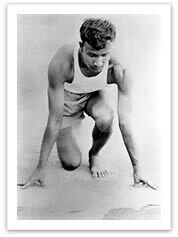 His interest in sport was not as a means of competition, but for a practical way of implementing his philosophy of self-transcendence. In the 1978, at the age of 47, he turned to long distance running and trained hard to be able to complete 22 marathons and 3 ultra-marathons. His fastest marathon time was his first marathon in Chico, California, in which he clocked a time of 3:55:56 Often he would go training as early as 4am in the morning. Sri Chinmoy wrote numerous accounts of his running experiences in his books “Run and Become”. In the late 1980’s, a knee injury curtailed Sri Chinmoy’s running career. He then became inspired to take up weightlifting. This was a sport in which previously he had shown little interest, but right from the beginning of his weightlifting career, he was able to make unprecedented progress. 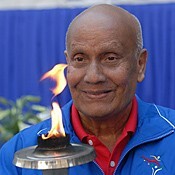 Up until his Mahasamadhi (passing), in October, 2007, at the age of 76, Sri Chinmoy continued to lift a unique variety of different weights 24 Bill Pearl (5 time Mr Universe) has acted as Master of Ceremonies at many of Sri Chinmoy’s weightlifting ceremonies. He has seen Sri Chinmoy lift a variety of objects and has often commented on his weightlifting feats. In April 2005, Sri Chinmoy’s calf raise lift was featured in Muscle and Fitness magazine as the second most impressive sporting achievement of the year. 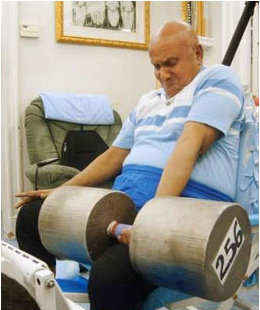 In September 2006, Sri Chinmoy lifted both Bill Pearl and world champion strongman Hugo Girard at a major body-building competition before an audience of some 1,500 spectators. During his Ashram days Sri Chinmoy received singing lessons from a musical teacher, which helped him to train his voice. However, most instruments he plays are self-taught; Sri Chinmoy preferred an intuitive approach which enabled him to compose music from the heart. He has performed at over 700 public concerts; usually he dedicated these concerts to world harmony or to certain individuals whom he felt had contributed greatly to the progress of the world. These included President Gorbachev, President Mandela and Mother Teresa. In 1993, Sri Chinmoy offered 39 concerts in honour of Swami Vivekananda attending the inaugural World Parliament of Religions in 1893. Swami Vivekananda was one of the first Indian Gurus to visit the West and he lived on earth for only 39 years. At these concerts Sri Chinmoy plays on a variety of instruments; these include traditional musical instruments such as Flutes and Cellos, but also less well known instruments. His most favourite instrument was the North Indian esraj. Sri Chinmoy’s music is meditative and soulful, appealing to the heart rather than the mind. Although his aim is to create meditative music, some of Sri Chinmoy’s performances on keyboard instruments also express tremendous power and dynamism, especially the organ, piano and synthesizer. As a composer he has composed over 21,000 songs in both English and Bengali. 27 These songs are primarily devotional in nature, expressing different aspects of the seeker’s spiritual journey. 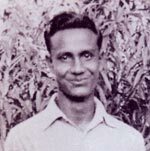 Uniquely, Sri Chinmoy has also composed many songs about individuals and individual countries. These songs are a way of honouring individuals and highlighting the good qualities of different countries. Through various initiatives, Sri Chinmoy sought to promote greater understanding and harmony between people. To this end, he met with people from different walks of life and prominent world leaders to exchange ideas and offer mutual encouragement. In June 1988, he initiated a unique programme called “Lifting Up the World with a Oneness Heart”. 29 During this programme, Sri Chinmoy would physically lift each honoree overhead in a specially constructed machine. It is a symbolic lift; Sri Chinmoy said that it is a way for him to offer gratitude to those who have made a most significant contribution to the betterment of the world. The World Harmony Run is organized by an international network of volunteers inspired by Sri Chinmoy’s vision of a more peaceful world. 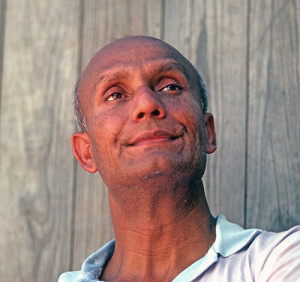 Even in the evening of his life, Sri Chinmoy was remarkably prolific. He constantly looked for new challenges and new ways to offer inspiration. In addition to his numerous outer activities, Sri Chinmoy, also served as a guide to approximately 6,000 meditation students around the world. He considered the spiritual progress of his students to be one of his most important tasks. Numerous people who have had the opportunity to meet and get to know Sri Chinmoy have commented on his goodness of spirit, impeccable character and selfless dedication to promoting global harmony.